Digital Stereoscopy is the 350-page bible of modern 3D technologies in which students, amateur moviemakers, and professional stereographers will find a clear description of all facets of the stereoscopic business as well as detailed information on the 3D-image production, distribution, and presentation workflow. Why buy "Digital Stereoscopy"? Digital Stereoscopy is the bible of modern 3D technologies where students, amateurs, and professional stereographers will find a clear description of all 3D facets of the stereoscopic business as well as detailed info on the 3D image production, distribution, and presentation workflow. Abstract and special features Stereoscopic images are a century old but the recent rise of digital 3D in all aspects of audiovisual production allows for a constant high quality level, making stereoscopy pleasant and comfortable for the viewer's eyes. The range of media influenced by stereoscopy is impressive, going from motion pictures and television to print and Internet distribution. Digital Stereoscopy will let you discover the basic principles of how we perceive objects in 3D, how we can shoot 3D pictures and movies, what digital processes are required to produce quality 3D images, and how 3D movies are distributed. We will also study less known aspects of the production workflow, such as 2D to 3D conversion, storage, real-time transmission for broadcasting, and 3D Blu-ray authoring. The various methods of displaying and projecting 3D images will be covered, along with their pros and cons. The book provides a large number of technical details on all these subjects, making it a reference work for professionals in the field, with explanations of the most commonly used software, hardware, and standards. To make the book as useful as possible, an abundance of sidebars explaining the most important concepts in each chapter and a glossary of the most frequently used 3D-specific terms have been included. Digital Stereoscopy provides a large number of technical details on all these subjects, making it a reference work for professionals in the field, with explanations of the most commonly used software, hardware, and standards. To make the book as useful as possible, an abundance of sidebars explaining the most important concepts in each chapter and a glossary of the most frequently used 3D-specific terms have also been included. Over 250 black and white diagrams and pictures complement the text, some of them accompanied by QR-code links to full-colour images on the web. Digital Stereoscopy is for anyone who wants to get involved in stereoscopic imagery or those who already work in 3D but want to hone their skills. Broadcasting students are not forgotten: The first chapters give the basic principles needed to discover 3D imagery, while the subsequent chapters contain the practical information that they will need to put them into practice. 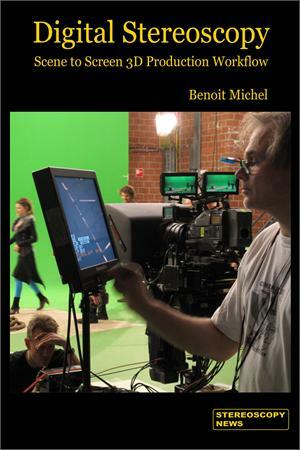 Benoit Michel is affiliated with ISU (International Stereoscopic Union) and on the scientific board of the IC3D conference.